No garden tool is as useful every day as a solid, 2-gallon watering can. The "rose" on the end, with the little holes, allows you to gently sprinkle seeds with gentle drops of water so that they don't wash away . . . or, if you tip the can a lot, you can get a powerful stream of water to help along older, established plants. 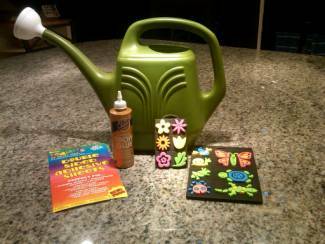 Since gardeners water almost every day, it's a fun idea to decorate the watering can that your Kids Garden Club will be using so much. It's also a great gift for a volunteer, a neighbor who has given you plants and seeds, a teacher who has put in lots of hours making your garden project special . . . just about anyone! If you can purchase waterproof, ready-made craft foam shapes such as flowers, butterflies, ladybugs and the like, you can easily glue or adhere them to the dry watering can, and you are done! Use Tacky glue for the best hold. Or you can use sheets of colorful craft foam, and cut out different sizes of circles to glue on top of each other to form flowerheads . . . or zigzag designs . . . or cut out the letters of the name of your Kids Garden Club . . . whatever you'd like. When you make a task like watering your garden extra-special, with a colorful watering can, it just makes gardening all the more fun.